We offer a complete seed treating service for grains and oilseeds, which includes a full line-up of seed treatments and inoculants. We have invested in high output treating equipment with precision metering and calibration tools to ensure the recommended rates are being applied to each crop type. It is our goal to provide our customers with high quality seed and the option of adding a top-performing seed treatment to protect their investment. 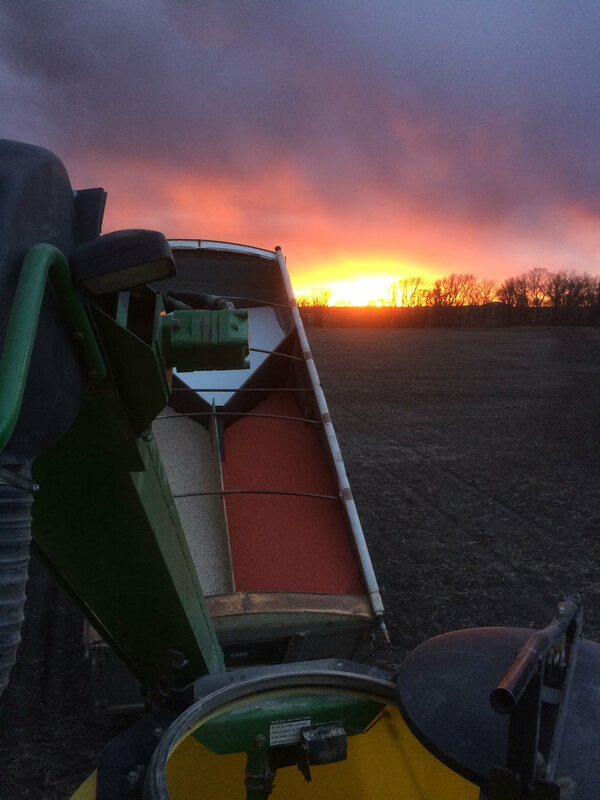 We take pride in offering a service that allows our customers to pick up treated pedigreed seed and head straight to the field, in a timely manner, with minimal stress. When handling expensive inputs, we feel the right technology is needed to guarantee accurate metering together with high output. Our soybean treater is a USC LPX 2000 drum treater. It comes complete with a seed wheel, flow meters, 2 peristaltic pumps and a 6-foot drum and calibration tubes. The seed wheel meters the flow of seed into the treating atomizer, meanwhile the flow meters record the amount of treatment flow into the atomizer, in order to ensure the proper rate of treatment is being applied to the quantity of seed. The two pumps give us the option of applying multiple products to the seed. The 6-foot drum allows for superior mixing to occur so that each seed is covered with treatment in a gentle tumbling process. The LPX 2000 can treat up to 1500 KG/min that comes with a touch-screen monitor to accurately record treating information. Together with the treater, conveyors, and hopper bottom bins, the seed is handled with high quality control. We have two Graham G40 treating systems for treating all cereal products. Both units are equipped with pumps, 50+ litre tanks, application gauges, agitation and dripless couplers to allow for high-volume treating and minimal mess. G40 treating units can treat up to 50 bu/min depending on crop type and variety. Both units are complete with a treating cart to handle totes, in order to treat high volumes with quick and easy handling of chemicals. Friesen Seeds Ltd. has been cleaning pedigreed seed for over 60 years, and we offer a wide range of cleaning capabilities. Our seed cleaning service focuses on conditioning and processing pedigreed seed along with custom cleaning for various growers and seed businesses within the Red River Valley and Western Canada. Each crop requires different machines and components in order to properly perform the conditioning process. We pride ourselves in customer satisfaction by offering a complete conditioning service to all our customers. Processing and bagging is another value-added service that is also available. Our warehouse allows us to have a complete bagging line with the option of either live loading containers or palletizing loads. The two screen machines combine air suction and shake over slotted screens to remove unwanted material from the clean sample. The grain travels over top of various sized screens that are shaking back and forth to uniformly size grain and clean out inert matter from the seed lot. The shaking along with air suction combines for a good portion of cleaning to be done over these machines. The indents are used to pick fine or course materials out of the sample. The indents are long open cylinders that are indented and spin counter clockwise to pick other material out of the sample. The gravity table combines air, shake, and slope to separate particles of different density. The lighter material is moved to the bottom side of the table and removed from the clean sample. The colour sorter features tri-chromatic cameras to catch full-colour images of the seed. It detects impurities with set filters and uses compressed air to eject the unwanted material from the clean grain. Bucket elevators and conveyors are used to move the grain within the plant from machine to machine as well as into storage bins. Dust hoods and suction tubes are set up in and around each machine to control the air quality and keep the plant as clean as possible.